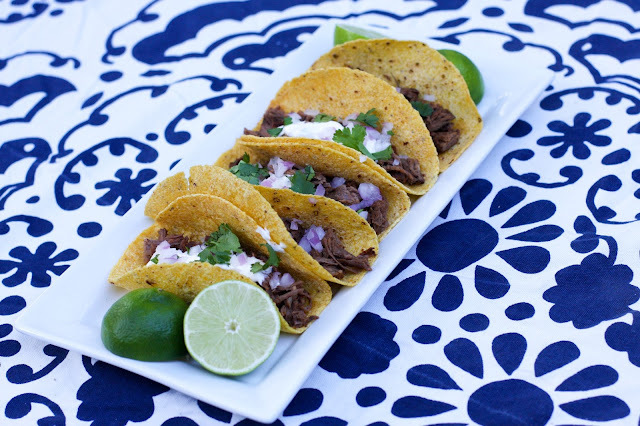 This week's Taco Tuesday is another Slow Cooker recipe. 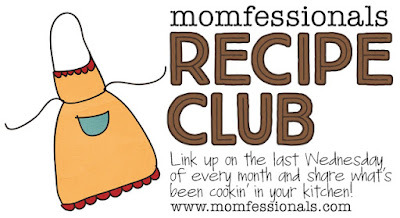 Yes, Crock Pot cooking requires a bit of planning ahead, but as a mom, it is so nice to have part of the meal ready and just waiting for you at dinner time. Also, I'll do anything to go stove and oven-free in this Alabama heat! And while Taco Tuesday usually calls for Coronas, I made sure to have celebratory margaritas on this day because it was a big/successful work day for Max! (Though you can't go wrong with a margarita on a normal work day, or a really awful one for that matter.) My recipe for a margarita is knock-you-off-your-feet strong, so be warned! Combine ingredients in a small pitcher and chill in refrigerator until ready to pour and serve! This fills two margarita glasses, which was plenty for us, but double or triple if you want more! Slow Cooked Flank Steak! Flank Steak has actually become increasingly hard to find, but I can usually luck out at Costco. It's a very lean cut of meat, so it needs to be either marinated or slow-cooked. It's also very inexpensive, which makes for a budget-friendly meal! This filling is super-simple: just apply the spice rub, place the steak in the Crock Pot, and cook on low all day. I've added chopped onion and chopped bell peppers before, but did the meat on its own for this meal. Cilantro from the garden, chopped red onion from our CSA basket, and sour cream. Mango Salad - this could also work for the topping on the taco. Mix spices in a small bowl. Rub the spices all over the flank steak and place at the bottom of a Crock Pot. Optional: Cover the steak with chopped onion, bell peppers, or both! Cook on low for eight-ish hours. Shred with a fork when ready to serve (I also chop the shredded pieces to bite-size portions with a big chefs knife on a cutting board). Chop first three ingredients and toss with lime juice. 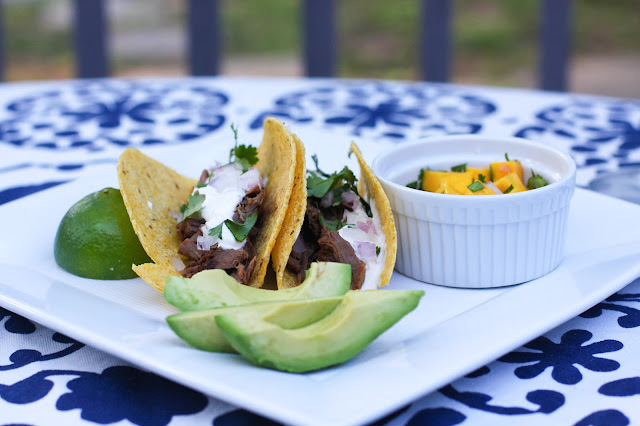 This was a nice light accompaniment to the tacos, but I've also used mango salad for a taco topping! I like your Margarita style! I will be trying this asap! I love adding to my mexican recipes! Five on the First Friday of June!